Neon pink jelly with glitter? Yes please! 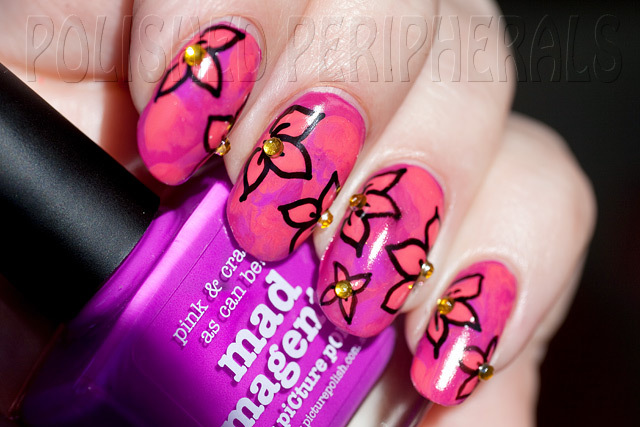 This is Jindie Nails Pickled Tink. It's a a limited edition polish for spring 2013 (I assume that's the US Spring because it's still Winter here). It's a bright neon pink jelly base with silver and light pink metallic glitter. There's little stars, large and small dots and lots of shimmer throughout. There's also tiny iridescent squares and hexes that glow green and purple when the light hits them. This is three coats and I love the way the glitter layers build up and show through the jelly. The little stars are so cute. I used a top coat to smooth this out but the stars were still a bit prickly. Another layer of top coat would fix that. It's UV/black light reactive so if you're out clubbing it's going to glow like crazy. I received this beauty from Sophie at Femme Fatale Cosmetics She also sent me Rainbow Honey cuticle balm in the scent Vanilla Dreams. I use a lot of cuticle oils and hand creams, especially in winter, so I'm always keen to try something new. 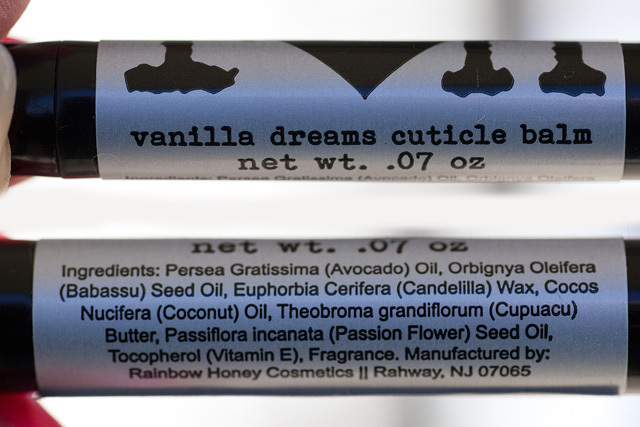 This cuticle balm is in a .07oz stick. Not sure what that is in metric but it's a perfect purse size and that's where I keep it, in my makeup bag. Actually it will need replacing soon, I've been using it so much. It's a firm stick that I just rub all around my nails including under the free edge. Then I just wait a minute for it to start melting on my skin then I use my fingers to massage it into my cuticles. It seems to soak right in without leaving my skin looking greasy, or at least a lot less greasy than liquid cuticle oil. I still like to have a good soak in the liquid stuff but this balm stick is tidier and quicker before photos and when I'm out. It smells lovely too. A nice soft scent that's especially nice at night when I sleep with my hands curled up under my chin. 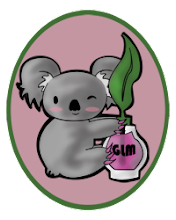 Jindie nails and Rainbow Honey are available from http://femmefatalecosmetics.com.au/, along with many other indie brands. Welcome to piCture pOlish Blog Fest 2013! I've been waiting for this day for a long time. Last year's blog fest was the highlight of my blogging year so of course I couldn't wait to be part of this year's event. If you've ever had a look at my stash list (linked above) you might have noticed I have quite a few piCture pOlishes, they are one of my favourite brands. They have such a great range of colours and awesome customer service. 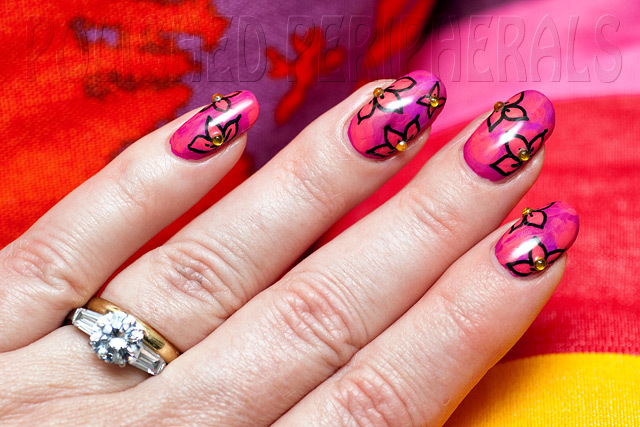 I'm not sure how many bloggers are participating this year but the challenge was to create our most "amazing nail art manicure ever" and include a step by step tutorial. Well I'm not sure about the most amazing art ever, that's a bit like choosing a favourite child (or polish). Each time I try a new nail art technique, and it actually works, I consider that my most amazing nail art ever. So I'll leave it up to you to decide if what I've come up with is amazing and I'll concentrate more on the tutorial part. I want to show you something that's so easy anyone can do it, no matter your experience. You don't need any special tools or mad skillz, not even a steady hand. It doesn't matter if you're left or right handed, this is one type of art where it's just as easy to do your dominant hand as it is your off hand. 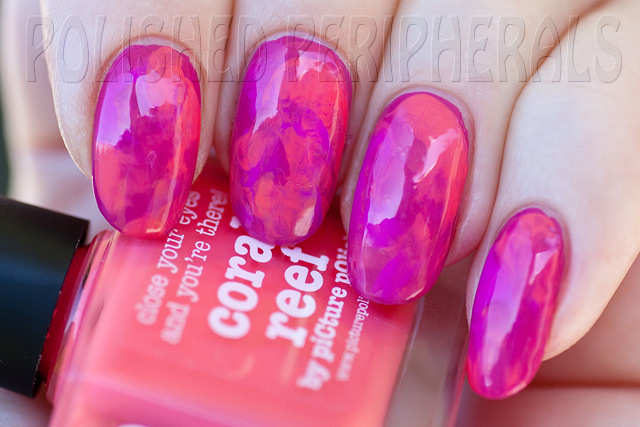 The polishes I received for this are Flirt, Mad Magenta and Coral Reef. All three are gorgeous summery colours from the piCture pOlish Bright Shades. As they are all similar tones I thought they would be perfect for a gradient or water marble but there's plenty of tutorials on the interwebs for those types of nail art and many people find them too messy. So let me show you something I call finger painting. Pick three colours and use one of them as a base colour. I used Flirt. It's a stunning colour, a bright magenta pink creme. Really easy to apply and no clean up needed. I could have used any of the three shades provided, I simply chose Flirt because it only needed one coat. All are beautifully smooth polishes but Mad Magenta and Coral Reef are best with two coats for opacity. 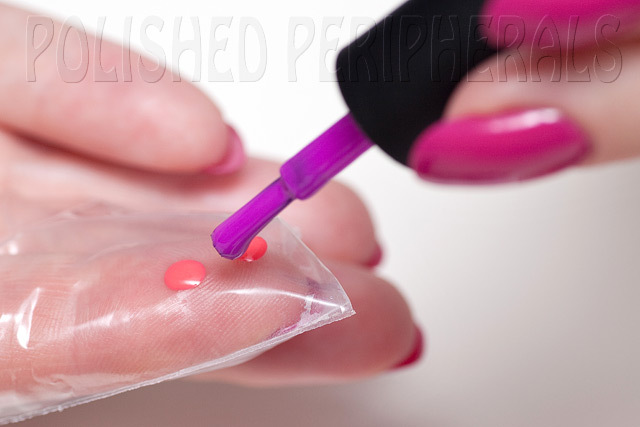 Paint your nails, no need for a top coat yet, then once your base colour is dry you'll need a plastic baggy (lunch bag) or some glad wrap (cling wrap). I prefer to use a baggy because I find glad wrap wrinkles too much but really you can use anything that will cover your finger and is polish resistant. A rubber glove would work too but you might want to test it first, I have some disposable gloves that melt on contact with polish. A small baggy is best, or if it's big I just cut off a corner to use. Grab your three polish colours and open them. Leave the lids sitting loosely. Trust me it's easier if you open them now, before you start 'finger painting'. Stretch the plastic over your index finger, keeping it smooth and wrinkle free across the pad of your finger tip. Then dot the colours on your plastic coated finger. I like to use two dots of the colour that will contrast most with the base but you can do how many and which ever you like. That's the fun of it. Just like a kid's finger painting you can do any combination. Then press onto your finger nail on the opposite hand. Press and squish it around a bit. If you're careful you can cover your nail without any overflow onto your cuticles or you can just go crazy and use acetone to clean up afterwards. I hate having to clean up with acetone so I go slow and careful with this. If you're really fussy or worried about mess you can put a strip of tape down the sides of your nails to protect your skin. I did take a photo to show how to mask but the flash didn't work and I only did it for one nail, so sorry no photo. I use painters tape for masking and tape manicures because it sticks without pulling off my polish. If you're using glad wrap you'll probably want to use a fresh piece for each nail but when I use a baggy I clean it off between nails using painters tape. I just fold the end of the tape back on itself on the roll and press my baggy/polish covered finger to the sticky side and the tape removes the polish. All clean and ready for the next lot of polish dots. There you go, both hands done, no clean up needed. Yes I know the nails on my right hand are shorter. I've been keeping the ones on my left at a set length while I'm swatching a collection that needs matching photos (but I just broke one tonight) while the right hand gets filed down more often. The results look similar to water marbling but the only tool you need is a piece of plastic and there's no mess. Such stunning bright colours and they go so well together. Makes me long for summer. If I'd used Coral Reef as the base colour it would have been even more vibrant. Of course finger painting can be done with any colours. I think I'll try adding some turquoise next time, maybe something like piCture pOlish Jade. Of course I can't leave anything alone so after wearing this for three days I painted on some flowers using Coral Reef, outlined them with black and added little gems for the centers. So what do you think of my finger painting? Do you think you'll try this technique? If you do I'd love to see the results. Flirt, Mad Magenta and Coral Reef are available from piCture pOlish at https://www.picturepolish.com.au/ or their international Network Members. All the piCture pOlishes I've tried have great formulas with nice brushes and I love the square faced bottles. All their bottles now have a cute little QR code sticker that you can scan with any smart device with a QR reader and it will take you straight to their web page. You can also find piCture pOlish on Twitter, Facebook, Instagram, You Tube, Google+ and Pinterest. Thank you piCture pOlish! These polishes are gorgeous and I've had so much fun playing with them. You wouldn't believe how many different designs I tried before settling on this simple tutorial. Now I can't wait to see the other bloggers designs. Here's a little linky that should make it easy to find some of them. Pretty Serious Cosmetics' most recent collection, "Hit the Road", had one polish that I absolutely had to have (OK so I actually pre ordered the whole collection but they were all must haves really). This is Pretty Serious 88mph. It's based on the DeLorean from Back to the Future. DeLoreans have doors that go up. My car has doors that go up. See the connection? I like to think of my car as the DeLorean's little sister so of course I had to have 88mph. 88mph is a jam packed, full coverage, glitter bomb. If you like it rough like the current sand textured polish trend then you'll love this without a top coat. A top coat (or two) will smooth it out but I actually love the texture. I couldn't stop touching it. Look at that gritty goodness! 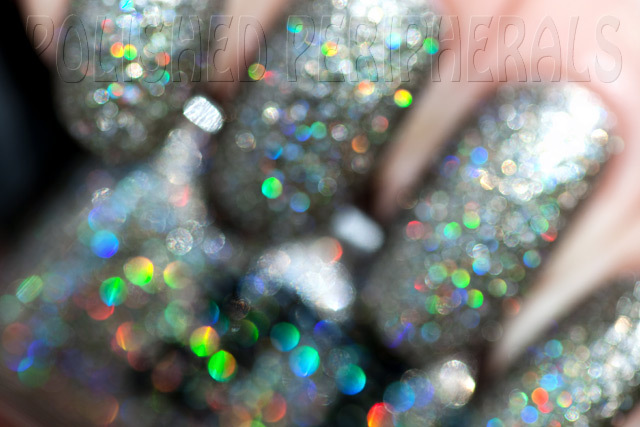 In the sun it sparkles like crazy so here's a blurry shot to show the holo rainbows. For a dense glitter this was wonderfully easy to apply. It looks thick on the brush but then it flows smoothly onto the nail. One coat will do but I used two which made the grey/silver look darker. Here's a shot with my car. 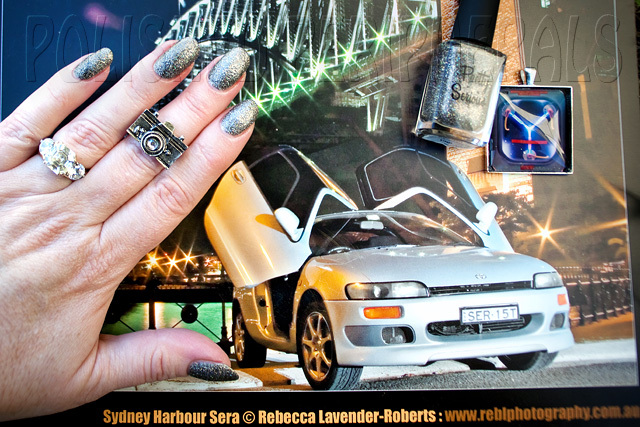 It was too hard to get my car and my nails in the same shot so I cheated and used a photo of my car from an old calender. My car looks pretty much the same now except it has nicer wheels and a shiny intercooler showing in the front grill. It's been in several calenders over the years (it's 23 years old). This was a 2007 calendar, the June photo. She was also Miss March, September and November that year. Pretty Serious 88mp is available from Pretty Serious Cosmetics at http://www.pretty-serious.com/ along with the rest of the Hit The Road collection. Love Thy Polish Eggshell is a creamy pale yellow with black micro hexes and large white and lavender coloured hexes. It's a lovely soft delicate look that really is reminiscent of an eggshell. I used three coats for this. It was opaque enough in two coats except for a bare spot on my ring finger where I dragged one of the larger hexes so I added a third coat. Smooth and shiny with a coat of INM Out the Door top coat. I wore this for nearly a week without any chipping. Love Thy Polish is an Aussie brand by Emma from Nails in the Desert blog and is available from Femme Fatale Cosmetics at http://femmefatalecosmetics.com.au/. While you're there check out the other amazing indie polish brands and Femme Fatale's own hand-blended mineral-based cosmetics. I love the eye shadows. The sample sizes make it easy to try them all.